Chris Hillman’s most recent solo project, The Other Side, was released nine years ago. Produced by Herb Pedersen, the fourteen-track album was issued by Sovereign Records. Among the fourteen songs are nine that Hillman co-wrote with his longtime collaborator Steve Hill. “True Love” is a mid-tempo dobro and mandolin centric number about the joy marriage and children bring to life. “Drifiting,” an acoustic ballad, is gorgeous and is similarly themed to “True Love.” Gospel themed “The Other Side,” adds a nice dose of fiddle into the mix and has an effecting lyric about heaven told through Hillman’s high lonesome bluegrass harmonies. “Heaven Is My Home” is an excellent gospel themed acoustic ballad about God and the Pearly Gates that’s also beautifully executed. “Touch Me” is more of a country ballad, with acoustic touches, and it’s very, very good. I also quite enjoyed the mid-tempo bluegrass of “The Wheel,” thanks to Hillman’s harmonies and the stellar production bed. Hillman and Hill also co-wrote “Heavenly Grace,” another excellent gospel flavored bluegrass number with beautiful ribbons of fiddle heard throughout. “I Know I Need You” and “Our Savior’s Hands” aren’t much different, while the latter is far more musically sparse, with acoustic guitar leading the way to frame Hillman’s voice. Hillman co-wrote “It Doesn’t Matter” with Hill and folk singer Steven Stills and it’s one of the album’s strongest tracks, thanks to a production bed that allows room for Hillman’s voice to shine through. “Missing You,” which Hillman wrote with Richard Sellers and Tom Russell, follows the same pattern and is another wonderful song. Two of the most interesting tracks on The Other Side are covers. Hillman gives a nice country-fried update to The Byrds “Eight Miles High” that transforms from 60s rock into stunning acoustic country. I love hearing the fiddle and mandolin front and center. The other cover is the traditional Celtic folk song “The Water Is Wide.” It’s the album’s centerpiece thanks to the crisp production and Hillman’s clear voice. In early 1990 The Desert Rose Band released their third album, Pages of Life, produced once again by Paul Worley and Ed Seay. The band’s third album, it was their most commercially successful, and their final charting release. Chris Hillman and Steve Hill wrote the album’s three singles. Synth heavy ballad “Start All Over Again” peaked at #6, mid-tempo electric guitar and drum led “In Another Lifetime” peaked at #13 (their third single to peak outside the top 10), and steel laced “Story of Love” peaked at #10. All three of the singles are horribly dated by today’s standards, but the Byrds-era steel riffs on “Story Of Love” help it stand slightly above the pack. At the time of its release, Pages of Life was distinguished for being a harder hitting album, even more so than the band’s two previous releases. Listening to it now, it isn’t terribly overly rock, although the drums are prominent. The album’s main shortcoming with regards to the arrangements is the synthesizers and use of late 80s production techniques that haven’t aged well at all in the last 24 years. Beyond the three singles, Hillman co-write six more of the album’s tracks, three with Hill, and three more with other writers. Hillman and Hill co-wrote “God’s Plan,” another ballad heavy on synth that utilizes the band’s harmonies framed in a horrible 80s sheen that mixes grossly with the flourishes of steel guitar in the musical bed. “Time Passes Me By” is far more tasteful, with the steel allowed room to breathe, but it’s still not a home run. “Darkness on the Playground” is even better still, livelier, and has a nice sinister production to match its ‘social cause’ story about troubled youth. Hillman co-wrote “Missing You” with Tom Russell and Richard Sellers. With glorious mandolin and the band’s tight harmonies, its easily one of the more country sounding tracks on Pages of Life, and a nice organic escape from the 80s sheen that suffocates most of the album. John Jorgenson co-wrote “Just A Memory” with Hillman and while track retains the awful 80s sheen, I don’t hate it, mostly because it also has a sunny vibe that keeps it somewhat engaging. “Everybody’s Hero,” which Hillman co-wrote with Michael Woody, is another of the album’s better tracks. I like the drum work and overly uptempo vibe but Hillman’s lead vocal sounds a little listless given the energy of the backing track. Hillman’s final co-write is courtesy of “Desert Rose,” co-written with Bill Wildes. It sounds like something Emmylou Harris would record, and was originally done by Hillman on his solo album of the same name. It’s a fabulous number and I love how its decidedly country. Overall Pages of Life is a shoddy album, thanks mostly to bad 80s style production that, as I aforementioned, hasn’t held up in the last 24 years. The songs themselves aren’t necessarily bad, but they’re made less enjoyable by the production. The Desert Rose Band was Chris Hillman’s biggest success in mainstream country music. The initial acoustic lineup, which crystallised on a tour with Dan Fogelburg, comprised Chris, Herb Pedersen, lead guitarist John Jorgensen, and bass player Bill Bryson. Drummer Steve Duncan and steel guitarist Jay Dee Maness were then added to the band, and a fresh yet mainstream sound emerged. They signed a deal with MCA/Curb and launched with their self-titled debut album in 1987, produced by Paul Worley. Their country-rock and traditional country influences combined to make an infectious and irresistible sound which was very radio-friendly. A sturdy cover of ‘Ashes Of Love’, which Chris had recorded on his solo Desert Rose album, was the group’s first single, and peaked at #26. 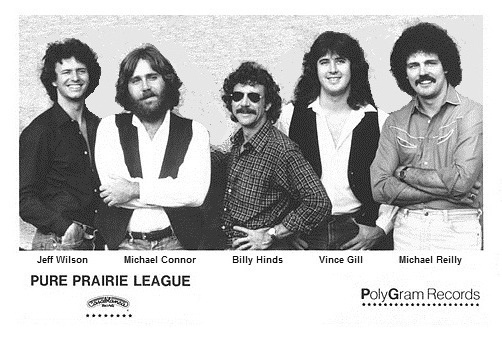 It was followed by the band’s first top 10 hit, ‘Love Reunited’, which was written by Chris with Steve Hill. The steel-laced song advises a couple not to separate but to work at their relationship. A second Hillman/Hill co-write here is ‘Glass Hearts’, a great up-tempo song about the conflicting emotions of a new relationship, with the fear of getting hurt if it doesn’t last. If she’s the one in trouble why’s it me that has to go? Finally, the album’s fourth and last single topped the charts. ‘He’s Back And I’m Blue’, a sad ballad about being the rebound guy who is out of the picture when the ex returns. Underlining the fact that the Desert Rose Band was a real group and not just a solo Hillman effort, Herb Pedersen sang lead on the country classic ‘Once More’. The wistful thoughts of the ‘One Who Got Away’ are (a Hillman co-write with Peter Knobler) are set to a sweet melody. The band revived Chris Hillman’s song ‘Time Between’, previously recorded by the Byrds, which is actually one of the less interesting songs. Great harmonies, great musicianship and great songs make this a classic and irresistible record. The creative renaissance that Travis Tritt enjoyed with the release of Down The Road I Go was unfortunately short-lived; 2002’s Strong Enough was a commercial and critical disappointment and 2004’s My Honky Tonk History, while slightly better than its predecessor, was likewise a mixed bag. Based on the album’s title, some fans might have been expecting a back-to-basics collection of traditional weepers; if so, those fans were likely quite disappointed, since the album often is anything but traditional. Ironically, the Luke Bryan and Patrick Jason Matthews title track is one of the most rock-leaning tracks Tritt ever released. The track’s production is rather heavy-handed, and this is also the case with the second track “Too Far To Turn Around”. Two tracks into the album I was bracing myself for a tedious listening experience; “The Girl’s Gone Wild” is more mainstream contemporary country but the lyrics are cliched and the whole song sounds like a retread of the Garth Brooks Hit “Ain’t Comin’ Home Til The Sun Comes Up”; a song of which I was never overly fond. The tune seems to have been carefully tailored to the prevailing tastes at country radio, but radio’s response was lukewarm and the tune topped out at #28. Fortunately things take a turn for the better starting with the fourth track “What Say You”, a duet with John Mellencamp. It’s not a traditional number by any means; it is more in the vein of something that Bob Dylan or The Byrds might have recorded. I’ve never been a fan of Mellencamp’s music but somehow the tune manages to work. It marks Mellencamp’s first –and to my knowledge, only — entry into the country Top 40. The record just missed the Top 20, peaking at #21. Following “What Say You” is the excellent “Circus Leaving Town”, a traditional steel-guitar drenched number which is by far the album’s best track. “Monkey Around”, a bluesy number written by Delbert McClinton, Benmont Tench, and Gary Nicholson provides a nice change of pace, and Tritt sounds as though he is thoroughly enjoying himself with this tune. “I See Me” is a more mainstream effort, a ballad about a father observing his young son. Earlier in Tritt’s career, this would likely have been a big hit but by this time radio had cooled toward him considerably and the record stalled at #32. By the last third of the album, the quality begins to taper off again, as the songs become more rock-oriented with offerings like “When Good Ol’ Boys Go Bad”, the anti-commercialism anthem “It’s All About The Money” and the don’t-get-above-your-raisin’ themed “When In Rome”, which closes the album. The two exceptions are the beautiful ballad “We’ve Had It All”, a Tritt co-write with Marty Stuart and “Small Doses” written by Jerry Salley and Chris Stapleton who would later enjoy a stint as lead vocalist for The SteelDrivers. “Small Doses” is the one tune here that sounds as though it belongs on an album titled My Honky Tonk History. Though it failed to spawn any major hits or earn gold or platinum certification, My Honky Tonk History did reach #7 on the Billboard Top Country Albums chart. His declining popularity with radio and creative differences with Columbia led to Travis’ departure from the label in 2005. With the major label phase of his career now over, he went on to experience even greater difficulties with the independent Category 5, with whom he signed in 2006. Uneven in quality though it is, My Honky Tonk History does contain a few very good tracks and for those alone it is worth picking up a cheap copy.